Sara received a Bachelor of Science in Kinesiology in 2008 from the University of Texas at El Paso. She continued her studies and received her Doctorate of Physical Therapy in 2014. Sara was able to gain experience in a variety of settings including acute care, inpatient rehabilitation, aquatic therapy, home health, and outpatient rehab. Her area of interest is orthopaedic and sports medicine rehabilitation. 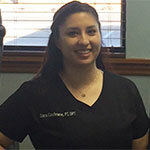 Sara believes in providing the most current and evidence-based treatment available and enjoys serving the community of El Paso, where she was born and raised. She attends courses throughout the year to ensure the highest level of care is available and is interested in pursuing an orthopaedic specialty certification. 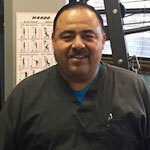 Mr. Robert Catzin is a physical therapy technician with more than 24 years experience. He began his career at Columbia East Medical Center in acute care. He then followed this with 14 years experience in an outpatient setting. His experience also includes orthopaedic, neurologic and cardiac rehab and sports physical therapy. Robert's goal is to provide the most efficient treatment and rehabilitation for all his patients.